I was wrapping up the very large Juanes section of my music/social unit with my Spanish III classes this week when I decided to include one more song, one that I had not used in previous years: Segovia. I have used a different tactic with each song in the unit, so I wanted something new for this one, too. The lyrics of the song include some words that were very new, but important to the song, as well as words that we had been including in our unit but may not have been fully grasped by everyone. I’ve bolded the words we have been including in our study below, and I have italicized the words that were brand new. Next I gave them the paper on which all of the key information had been placed randomly. They listened to the song again (just the first minute and a half) without seeing the lyric video, and I asked them to put a check by every phrase that they heard. After that, I had them count how many they had heard. While some had only heard 5 – 7 of the phrases, most had heard 10 -13 (there are 13 phrases in total). We then went through the phrases and they told each other what they meant, checking with me when they were unsure. I then finished playing the song while they answered the questions at the bottom. 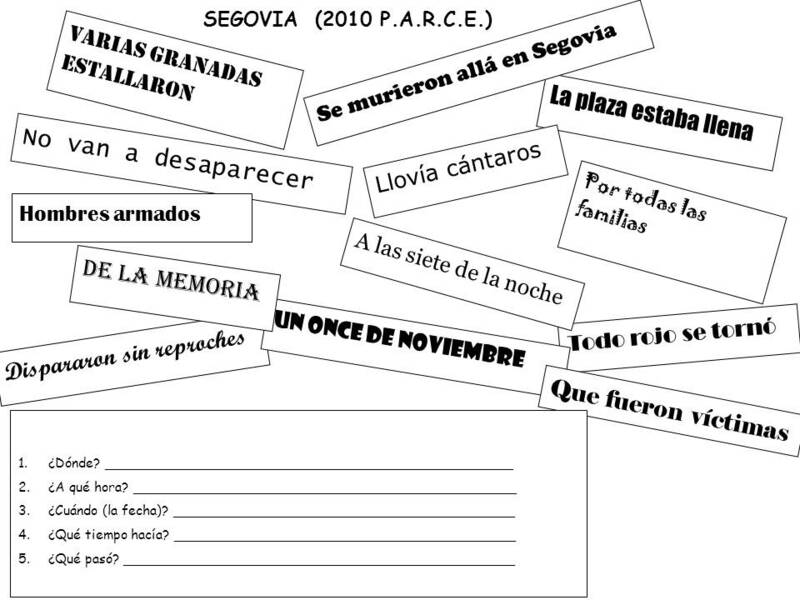 After having done that, they were very capable of narrating the story of what had happened in Segovia. 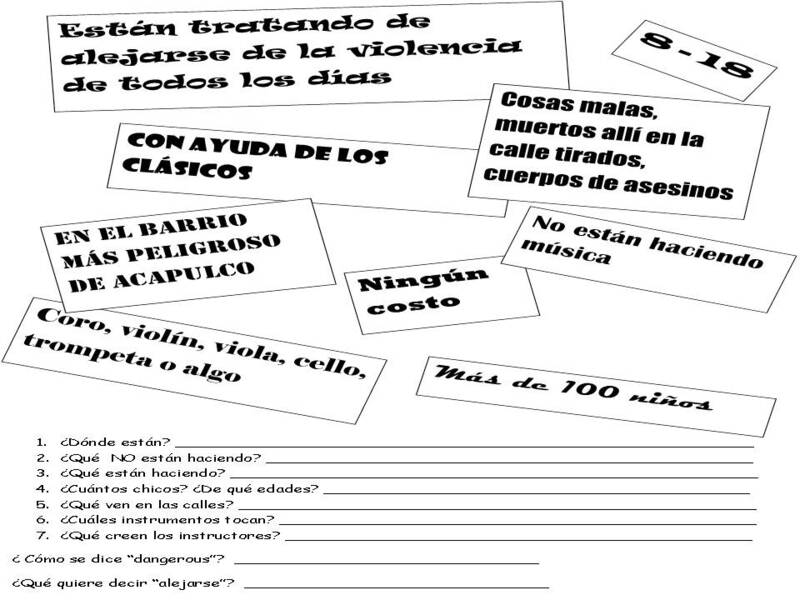 This entry was posted in activities with music, conversation, current events/news, informal assessment, Juanes, listening comprehension, music, partner work, reading comprehension and tagged Juanes, listening comprehension, music by sraslb. Bookmark the permalink. Thank you for sharing!!!! You know I read your blog ALL THE TIME!!!! Neat song activity! Thanks for sharing! Thanks, Martina! I’ve been following all of your activities, too!!! You are providing a great source for teachers. After 20 years of experience Spanish in the classroom myself, you are providing me great ideas to incorporate history, culture, and not to mention vocabulary and grammar. I appreciate and admire your talents and the time you devote to your students. I’m sure you are !Maestro Sobresaliente!.